Since the purpose of a radiant barrier is to reflect heat, it stands to reason the more reflective the surface, the better it will perform. Also, testing has shown multiple layers of reflective surfaces work much better than one. 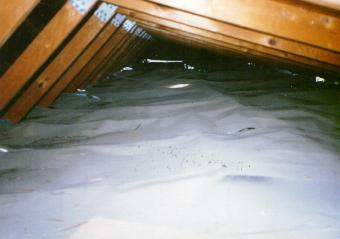 Fact is, dust is the Achilles Heel of all radiant barrier products only having a single membrane. A true radiant barrier, as invented by Sir James Dewar at the turn of the century, is two highly reflective surfaces facing each other with an air space or vacuum in between. Our products are designed this way. Our membranes are not laminated. Laminating a reflective surface to anything reduces the performance by conductivity. The radiant barrier you see here was once very reflective. If you look closely you can still see how reflective it was where the flash hit. This is because it's vertical and dust did not settle on it. The long thin line at the far end of theattic is the RBS going up the gable wall a few inches, reflecting light. Light and heat move together at the same speed. The camera easily picked up the once reflective RBS from the darkest and farthest point from the lens. Infrared heat is the same. Dust absorbs the light as can be witnessed in this photo and absorbs infrared heat the same way. So how do you overcome the dust problem? Fact: dust is the Achilles heel of radiant barrier. The multiple layers of Thermal Control Membrane addresses the dust issue. it's way into your walls and ceiling. With rising energy costs it really makes ¢ents. This dust issue very effectively and quickly negates the performance of radiant barriers rolled out over your existing insulation in vented attics. 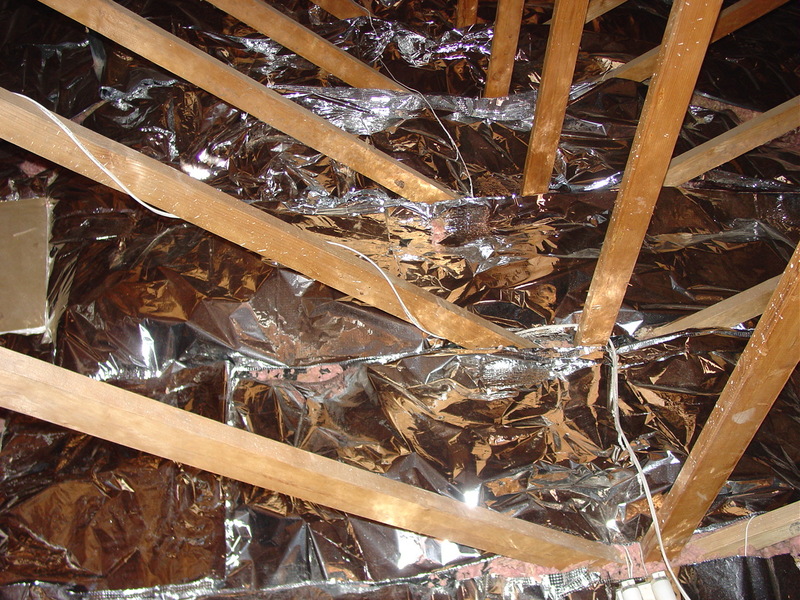 Proper applications for sheet type radiant barriers include: wall systems, stapled up under flat roofs, NEVER STAPLE UP UNDER A PITCHED ROOF! THIS APPLICATION WILL INCREASE ENERGY USE AND DECREASE COMFORT! TCM has a lifetime transferable performance warranty. 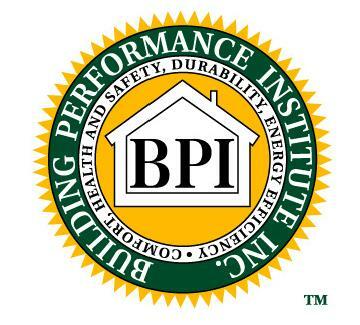 Contact us if you are a custom home builder, remodeler or a home owner looking to "do it right the first time". Questions? Email us at pleasesavenrg@gmail.com or call our office at 602-867-3176. Web page design and maintained by B Rad Design Group. Copyright 1997-2019. All images and text copyrighted by Horizon Energy Systems.